The Rhode Island minimum wage was last changed in 2008, when it was raised $3.10 from $7.40 to $10.50. Rhode Island's minimum wage rate is linked to a Consumer Price Index, which is intended to raise the rate along with inflation. The current minimum wage rate is re-evaluated yearly based on these values. Rhode island's current minimum wage is $10.50 per hour as of January 1 2019. The tipped wage is $3.89. Rhode Island's minimum wage was raised to 9.60 per hour on Jan 1, 2016 from $9.00 per hour in January 2015. It was previously raised from $7.75 to $8.00 per hour in January 2014 and $7.40 to $7.75 per hour in January 2013. Prior to 2013, the Rhode Island minimum wage had not been raised since 2007. Rhode Island allows special minimum wage rates to be paid to minors under 16 years of age working 24 hours per week or less ($7.20 per hour, 75% of the minimum wage) and full-time students under 19 working for nonprofits ($8.64 per hour, 90% of the minimum wage). Domestic employees, immediate family of the employer, and employees working at seasonal eating or recreation facilities/camps are exempt from the Rhode Island minimum wage. Other notable labor laws in Rhode Island require all hourly employees working on Sundays to be paid overtime, and require that any employee required to report to work for a shift be given at least three hours worth of work (or three hours worth of pay). Rhode Island employers may not pay you under $10.50 per hour unless you or your occupation are specifically exempt from the minimum wage under state or federal law. If you have questions about the Rhode Island minimum wage, please ask us and someone will respond to you as soon as possible. Looking for a new job? Use the free Rhode Island job search utility to find local job openings hiring now. All Rhode Island employers must display an approved Rhode Island minimum wage poster in a prominent place to inform employees about the minimum wage and their worker's rights under Rhode Island labor law. Think the Rhode Island Minimum Wage should be raised? LIKE on Facebook! The Fair Labor Standards Act (FLSA) and Rhode Island labor law requires all employers in Rhode Island to visibly display an approved Rhode Island minimum wage poster, and other Rhode Island and federal labor law posters, to ensure that all employees are aware of federal and Rhode Island labor law and overtime regulations. Failure to display a Rhode Island labor law poster in the workplace can result in severe fines. 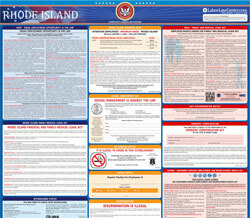 Instead of printing out pages of mandatory Rhode Island and Federal labor law posters, you can purchase a professional, laminated all-in-one labor law poster that guarantees compliance with all Rhode Island and federal posting requirements. Fully updated for April 2017! The Rhode Island minimum wage poster, and additional required Rhode Island labor law posters, are also available on the Rhode Island labor law posters download page. All workers who put in over 40 weekly hours are entitled to a minimum wage of at least 1.5 times the regular applicable minimum wage	(learn more about Rhode Island overtime pay). Some states require workers who work over a certain number of daily hours to be eligible for this overtime rate as well (Rhode Island law does not specify a daily overtime limit). The FLSA guarantees all RI employees adequate overtime compensation for all qualifying overtime hours worked. If your employer does not pay adequate overtime wages, you can file an unpaid overtime claim with the Rhode Island Department of Labor. Rhode Island Under 20 Minimum Wage - $4.25 - Federal law allows any employer in Rhode Island to pay a new employee who is under 20 years of age a training wage of $4.25 per hour for the first 90 days of employment. Rhode Island Student Minimum Wage - $8.93 - Full-time high school or college students who work part-time may be paid 85% of the Rhode Island minimum wage (as little as $8.93 per hour) for up to 20 hours of work per week at certain employers (such as work-study programs at universities). Rhode Island Tipped Minimum Wage - See Here - Employees who earn a certain amount of tips every month may be paid a lower cash minimum wage, but must earn at least $10.50 including tips every hour. For more details, read about the Rhode Island tipped minimum wage. What is the Rhode Island minimum wage? The current Rhode Island minimum wage of $10.50 per hour is the lowest amount a non-exempt employee in Rhode Island can legally be paid for hourly work. Special minimum wage rates, such as the "Rhode Island waitress minimum wage" for tipped employees, may apply to certain workers. How much will I earn working a minimum wage jobin Rhode Island? A full time minimum wage worker in Rhode Island working 40 hours a week, 52 weeks a year, will earn $84.00 per day, $420.00 per week, and $21,840.00 per year1. The national poverty line for a family unit consisting of two people is $16,020.00 per year. What is the Rhode Island under 18 minimum wage? Rhode Island employers may pay 18 year olds and minors the youth minimum wage of $4.25 for the first 90 days of employment. Other labor law exemptions for minors in Rhode Island may exist. I still can't find the answer to my question about the Rhode Island minimum wage! 1 These earnings estimates do not account for the Rhode Island income tax , federal income tax, or local/municipal income taxes. The yearly earnings estimate of $21,840.00 is based on 52 standard 40-hour work weeks. Since most hourly employees don't work full time and/or take time off, actual yearly earnings will likely be lower.